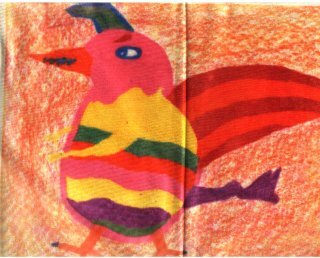 When I was a child, I use to draw stylized, side profiles of bird-like chimeras. They were not natural birds, but were more upright, like something out of Egyptian mythology. I don't know why I did this. I liked to stylize my art and wasn't interested in realism. Maybe it was from a book The Magic Finger by Roald Dahl that haunted me, one of the scariest books I had ever read, where duck hunters suddenly find themselves as ducks, but the ducks now have guns and begin to hunt the people. Later, when I got older, I shot a robin with a bb gun, the only animal I ever killed besides the fish I caught and ate, and that has haunted me. I wanted to see if I could do it, use technology to bring down nature, and sure enough, it did. When I reached my 20's, I became a vegetarian for 20 years. My father loved birds, and kept a pigeon loft on his flat roof in Tehran, and he later allowed us to have pet ducks, and eventually parakeets and cockatiels. One day, when I was a teenager, I was standing in my front yard and saw a giant black bird fly over my house. It was bigger than an eagle or falcon, bigger than any bird I had ever seen. There were tiny birds chasing it on both of its wings, which gave me an idea of its scale. It flew behind another house and disappeared from view. Nobody else in the area saw it, and nobody else had ever seen the size or type of bird I described. I remember hearing no sound, though, which was odd considering all of the birds. As I got older, the idea of an invisible bird creature stayed with me. In my LandmarkFilm, it was inter-dimensional, some kind of protector or guardian of something, and was as old as the earth. Mythology is full of creatures like this. I began thinking that this creature was an archetype of man. At first, I thought it makes sense from a scientific perspective, as we probably evolved as tiny mammals to fear birds in the sky, and that pattern may have stayed with us as humans, which is one proposed reason why archetypes exist at all. But I felt that this creature was not a creature in the past, that it is still here, but hidden from us. And if it was from a fear of birds attacking us from above, like a visual memory, then why did I always draw side profiles of them when I was a kid? Why didn't I draw birds from above, clawing down at me? 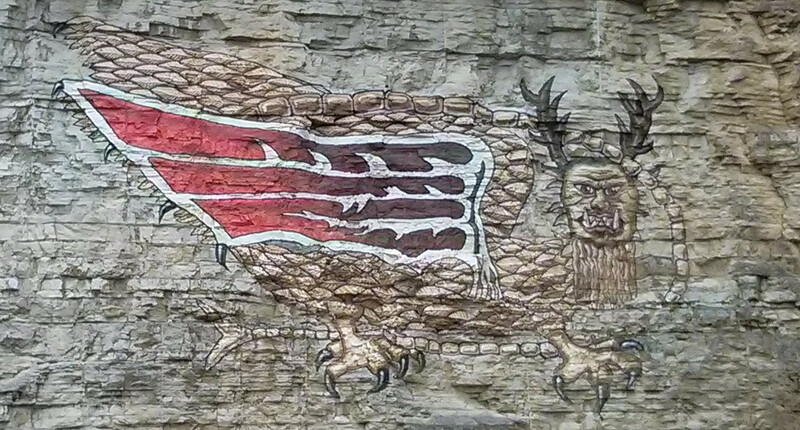 I didn't find out until later that on the cliff of the Mississippi river not far from me was an ancient painting of a "Piasa" monster, a similar creature that somebody, hundreds of years ago, had felt it important enough to paint on the cliff wall. 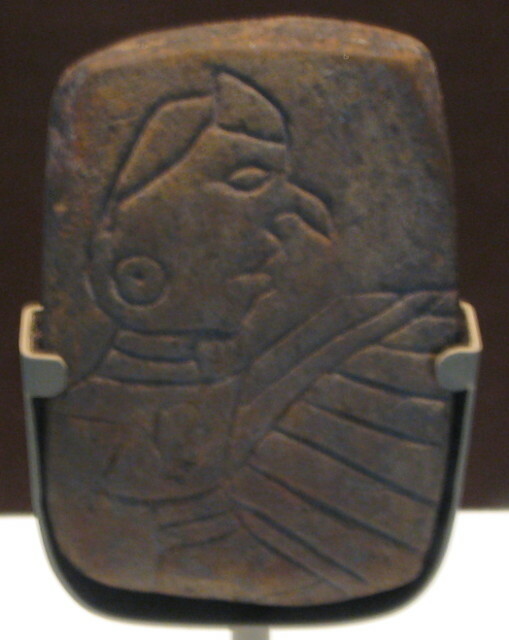 A little farther south down the river is Monks Mound, one of the largest earthen mounds in the world, and one of the few artifacts found there was a tablet called the Birdman, a depiction of a another bird-like man, side profile. 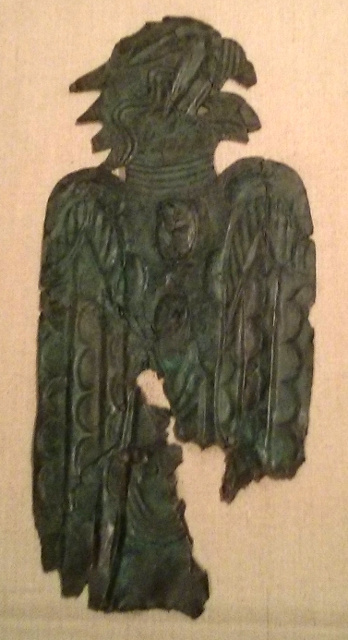 There is also a collection at the St. Louis Art Museum which has copper bird artifacts from other areas of Missouri that they think is related to the Mississippian culture. I have since been intrigued with the mothman and other mythical creatures and believe there may be some substance to this, that it may be some kind of inter-dimensional being that has been with us for a long time. The winged bulls of ancient Assyria are also similar. Also, curiously, is the fact that out of all of the animals of the Chinese zodiac, only one of them does not exist today, the dragon. Was that purposeful, or did the dragon actually exist when the zodiac was created? This is a scary thought, but have you ever wondered who our predator is? Almost every species has some kind of natural predator, an animal with significant skills in hunting and catching its prey. But humans have no predators... or so we think. If the world is fractal, and patterns we see around us repeat, we should have a predator somewhere. Perhaps that it why it is a good predator--we can't detect it. Or perhaps we are being farmed and controlled in some manner like cattle. The bird creature archetype that I feel, though, is not so much evil as it is ominous. 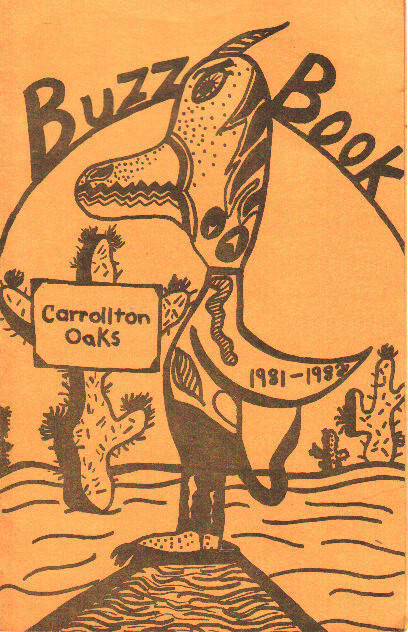 One of my bird drawings became the cover of my school telephone directory one year, but at that time, I had no idea that I would have such a strong interest in telephony and communication later in life. A bird even inspired me to build a new communication system. Perhaps a bird, like the dark masses of passenger pigeons↗ that once blotted out the sky, is simply a messenger, a form of InformationInFlight.